WANT TO CONTEMPLATE MORE ABOUT FAMILY WORSHIP? Family Worship - (by Donald Whitney) Great concise and practical guide for family worship. Family Worship - (by Joel Beeke) This book is a helpful and motivating guide to implement or increase the depth of your family devotions. The Family Worship Book - (by Terry Johnson) This book equips you for leading your family in worship with the help of some key questions: What is family worship? What have other people done? Why Should I do it? How can I start? Thoughts on Family Worship - (by J. W. Alexander) This book is a great read for fathers to encourage them to start family worship. How to do family worship - Video (by Donald Whitney) Great 4 minute video explaining how to do family worship. How do you do family devotions? - (by John Piper) Concise overview of what John Piper has done for Family devotions. Family devotion ideas - (blogpost) This blogpost includes several ideas and links to other resources. The 3 Components of Family Worship are (1) Read (2) Pray (3) Sing. 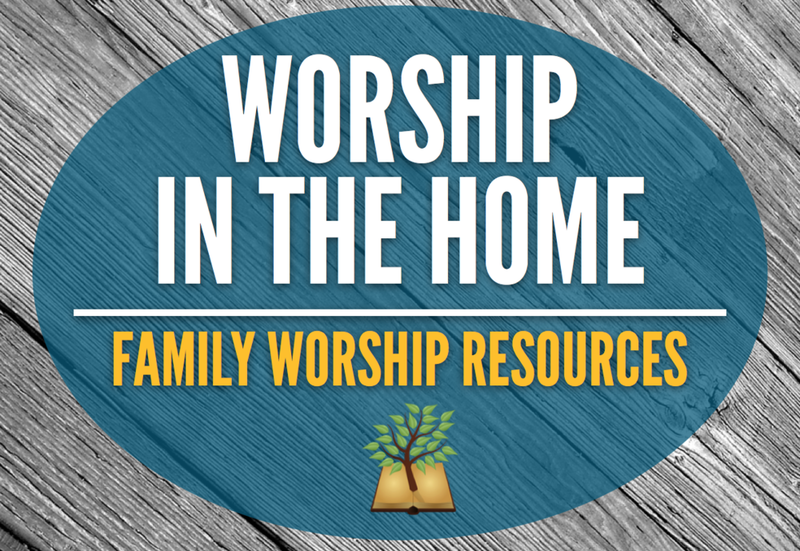 These categories below contain links to several helpful ideas and resources designed to equip and enhance your quest for fruitful family worship. Long Story Short & Old Story New - (by Marty Machowoski) Well-written, concise devotionals designed for 10 min per day, 5 days per week. Gives a good overview of the Old and New Testament. Family Worship Bible Guide - (by Joel Beeke) This Family Worship Bible Guide presents rich devotional thoughts on all 1,189 chapters in the Bible, including searching questions to promote conversation, to help you with this responsibility. The Bible in Pictures for Little Eyes - (by Kenneth Taylor) This read-aloud book will give your children an unforgettable introduction to the Bible, helping them along with simple language and engaging illustrations. Great for younger children. The Jesus Storybook Bible - (by Sally Lloyd-Jones) This book portrays several stories throughout the Bible, pointing young hearts to Jesus. Big Truths for Young Hearts - (by Bruce Ware) The book covers ten topics of systematic theology, devoting several brief chapters to each subject, making it possible for parents to read one chapter per day with their children. Good resource for the teen level conversations on theology. The Big Picture Story Bible - (by David Helm) This book uses simple words and striking illustrations unfold the storyline of God’s Word from Genesis to Revelation. Day by Day Kid’s Bible - (by Karyn Henley) This is a unique tool to help children establish Bible-reading habits for a lifetime―with an investment of just seven minutes per day. New City Catechism for Kids - (by Crossway) The New City Catechism is a modern-day resource aimed at helping children and adults alike learn the core doctrines of the Christian faith via 52 questions and answers. Helpful app with simple songs to go along with the questions and answers. Great for kids! A Baptist Catechism - Pdf Download (adapted by John Piper) A very helpful overview of The Baptist Catechism and a listing of 118 questions and answers. Great resource! Why Christmas? - (by Barbara Reaoch) This is a helpful devotional with Scripture readings, memory verses, Christmas carols and questions to direct your child s heart towards God. Why Easter? - (by Barbara Reaoch) This illustrated devotional contains 28 lessons - one for each day of the four weeks leading up to Easter - in a short, focused format designed to help parents show the Christ of Easter to their children. Proverbs for Parenting - This book arranges the proverbs into over 70 realistic, helpful topics. Our 24 Family Ways - This resource seamlessly weaves together devotional interaction with discipleship instruction for the whole family. The Gospel Alphabet ABC’s - (by Stephanie Coffey) 5x7 flip book to help teach the truths of the Gospel in a simple way. Each letter has a Scripture verse that contains a word that begins with that letter. Seeds of Character and Character of God Memory Cards - Printable memory verse cards. Who says you can’t memorize? fun ways to learn Bible verses - This book shows you how to memorize while you are doing what you like to do. Combining your favorite activities with memorization is a great way to learn Bible verses. Fighter Verses & App - (by Desiring God) - The five-year Fighter Verses™ Bible memory program features 260 essential verses to arm believers to faith for faith and love, and against unbelief and sin. 6 Reasons to Pray the Bible - Blogpost and video (by Don Whitney) Challenging and motivating to pray the Bible. How do I Pray The Bible? - (by John Piper) Instruction from John Piper on praying the Bible. Long Story Short & Old Story New - (by Marty Machowoski) Contains sections at the end of each devotional on prayer. Idea: Create a booklet of missionary prayer cards from missionaries our church supports and pray for one missionary per day. Hymn of the Month Free Printable PDF’S - (by April Brover - Happy Hymnody) Great resource to aid your family in a hymn per month. Hymns include lyrics, sheet music, artwork and chords. Scripture Lullabies: Hidden in My Heart - Beautifully orchestrated simple scripture texts set to song. Hide ‘Em in Your Heart - (by Steve Green) 2 CD set of simple catchy Songs of Scripture set to tunes. Well orchestrated and great for kids. Student Hymnal: Essential Hymns Every Child Should Sing - A hymn book that is also a history book of hymn backgrounds as well as a devotional book of what the hymns mean as you sing them. These 115 hymns were carefully selected as essential hymns that every child needs to learn and sing! Ancient to modern, these hymns cover the Church Year, the attributes of God, and our responses to God for all He has done. Getty Kids Hymnal - 12 hymns old and new sung by kids for kids of all ages to sing along to! Recorded with kid friendly arrangements by the Getty Band. Sing! - (by Keith an Kristin Getty) Authors, lyricists, and worship leaders Keith and Kristyn Getty write this book to church members to remind them why the Church should sing, when the Church should sing, and how the Church should sing. Chapter 5 is an excellent chapter on singing at home with your family. A very practical and helpful resource.